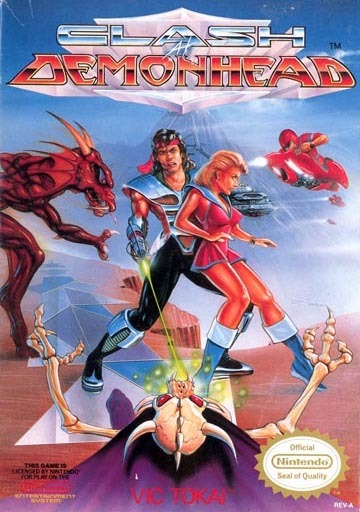 This is one of those games I rented because the box art and the screenshots looked way too cool. I mean, come on, it has a picture of a guy holding a girl while blasting a demon in the face! Nintendo Power showed some screens of different uniforms -- yes, that's different uniforms! Like a jetpack, scuba gear, and running boots, to name just a few. The game really gives you no sense of direction while you play. Bosses seem to simply appear in zones as you move across a map, picking areas to explore next. They give you some hints on where to go, but the game really leaves you wandering around. Why play it based on that? Because it's fun! Switching suits and blasting random bad guys is great, and the occasional boss is shaped like some sort of large anime creature. (Note: I do not like anime, but the game art is very good). 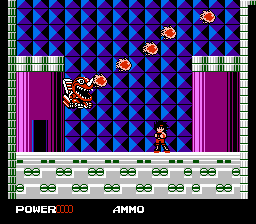 You can call down a shop whenever you want to buy more power ups to blast things harder and faster! 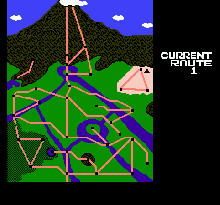 The game features an overworld map that lets you pick your direction and where you want to move. At any time you can leave an area or fall into a pit and run out to select a different zone. Because of this, you'll spend hours going back and forth trying to find the medallions needed to save the world. If you want a difficult platformer with non-stop shooting and jumping, this game is for you. Pick it up and give it at least an hour to explore and get the feel of the game. Then I truly believe you'll enjoy it.